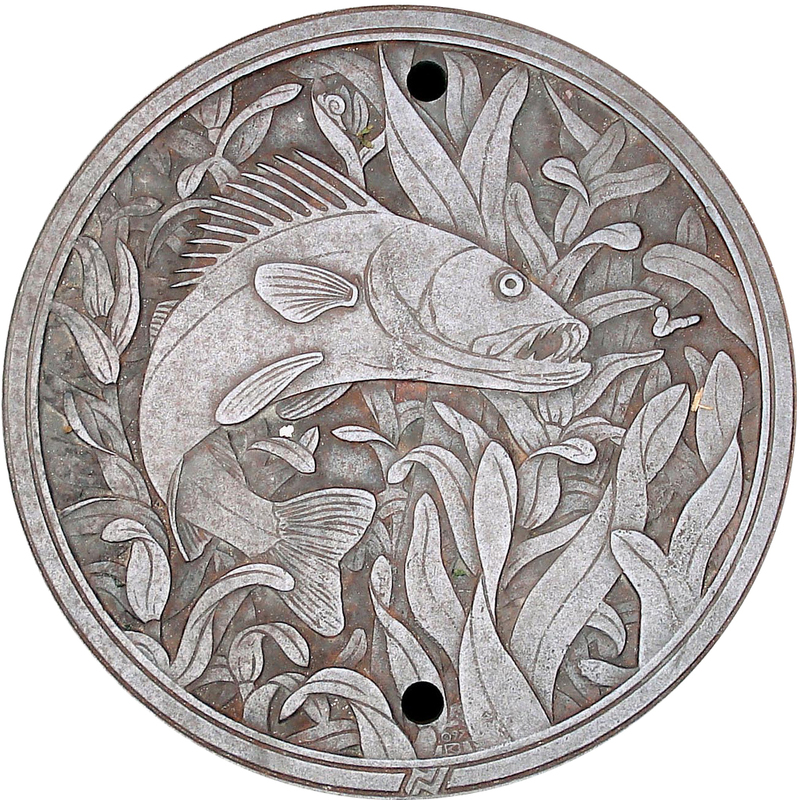 Walleye art in Minnesota: one of a series of eleven manhole covers in downtown Minneapolis designed by Kate Burke; photo by Tom Magliery on Flickr (noncommercial use permitted with attribution / share alike). 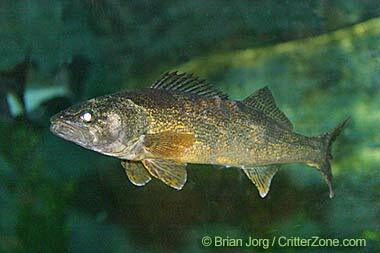 Walleyes are most at home in the large, clear, cool lakes of Minnesota’s northern forests. Their eyes are sensitive to light, so they go to deep, dark waters during the day and move to shallow areas at night. Minnesota’s record walleye weighed 17 pounds, 8 ounces. They are called walleye because their eyes reflect light. The Minnesota Department of Natural Resources stocks walleye in about 1,000 lakes covering roughly 1 million acres (Minnesota has a total of about 2 million acres of walleye water). Walleye showing reflecting eye; photo © Brian Jorg / CritterZone Animal - Wildlife - Nature Stock Photography (all rights reserved; used with permission). 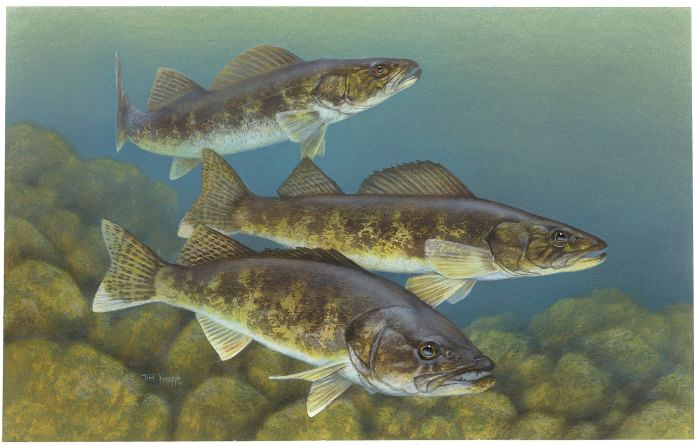 Walleye (Sander vitreus) artwork by Timothy Knepp / USFWS (public domain image on Wikipedia). 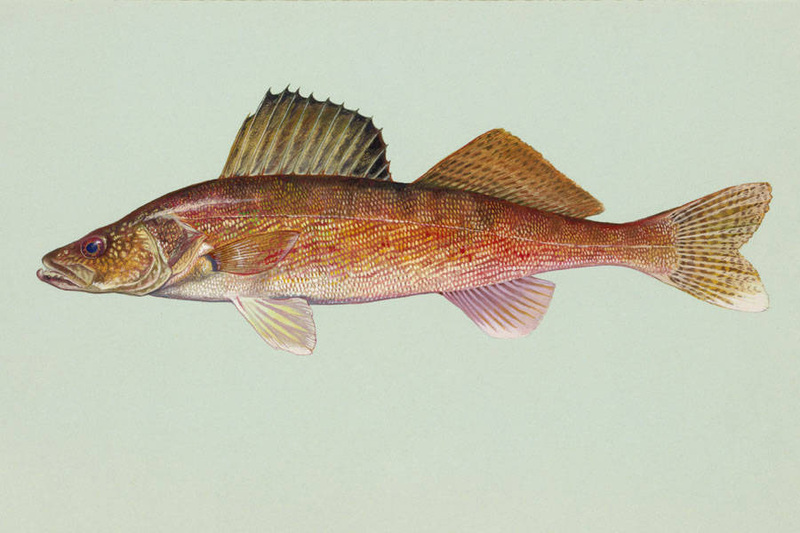 Walleye (Stizostedion canadense); illustration by Duane Raver / USFWS Digital Library: Walleye (public domain image).